While hunting for inspiration for a current design project, I came across this amazing landscape. It is the Earth Sciences garden at Monash University and it is stunning. 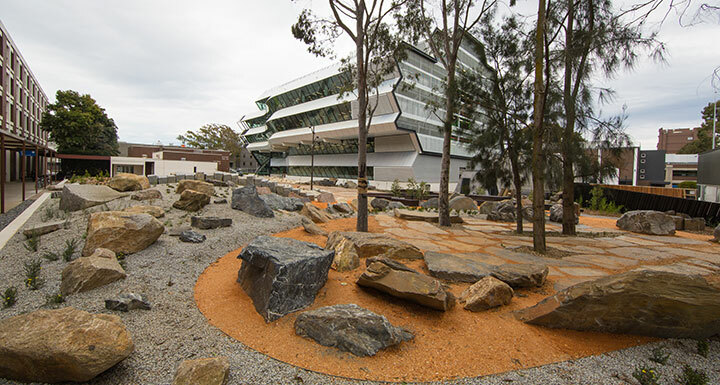 The landscape architects at Rush/Wright Associates have created a landscape that displays geological forms throughout Victoria and while this provides great learning opportunities for students, the result is also strikingly beautiful. Rocks are a valuable element to a garden and provide a solid and earthly connection between our built forms and the natural landscape. You don’t need to go to the extent of the Earth Sciences Garden (unless you REALLY love rocks) but there are a number of ways that rocks can be used in your garden. As a functional element, rocks can be used to retain soil and allow changes of level. If you don’t want a solid retaining wall but have a steeply sloping area, a collection of rocks can provide stability to an embankment. The degree of level change and slope will determine the structural requirements of the rockwork. A steep embankment may require the rocks to be set in concrete or with mortar and a shallow slope allows rocks to be placed more sporadically. Rocks and water features have a natural relationship. Flat rocks can provide stepping or sitting platforms next to a pond and rock outcrops can be the source of a water fountain or waterfall. This even extends to swimming pools and the iconic Australian pool of the 1970s often featured a rock wall and water fall at one end. Garden borders of volcanic rock (basalt) are another iconic Australian garden element. I’m not sure who was sourcing all this volcanic rock in the 1960s and 70s, but there is a lot of it around! A rock edge to your garden provides a functional break between mulch, lawn or gravel path and is perfect for an Australian bush garden. So many of us grew up in a house that was surrounded by beds of volcanic rock and it is a material that is versatile, often lightweight and readily available. An abundance of volcanic basalt forms a lighweight border in this 1960s Beaumaris garden. Rocks have been used for centuries in traditional Japanese landscapes, with rock selection and placement an intricate exercise in symbolism. Rocks are classified as horizontal, vertical or even angular and are used to represent broader landscape ideas such as mountains or islands (in a sea of raked sand) or even more spiritual elements of moving planets and stars. Finally, the natural beauty of rocks can be used as purely aesthetic elements in your garden beds and amoungst the soft textures of your plants. Rocks in nature are wonderful inspiration for placing rocks in your garden and with a few simple ideas in mind, you can have beautiful outcrops and features. The key to placing rock is to use nature as your guide. Natural rock outcrops are just the tip of a larger expanse of rock that is breaking the surface. Therefore it is important to bury a fair amount of your rock in the soil. While this seems like a ‘waste of rock’ the visual results are far more impressive than a small boulder sitting on top of the dirt. A large flat rock gets buried. Australian landscape architect, Ellis Stones was a master at using rock in his gardens and I have always followed his guidance when placing rocks. It can be quite daunting when you are faced with a pile of rocks in your driveway, but what is required is careful selection of each individual piece for its shape and size. Most rocks will have a naturally flat side and by examining each rock you can establish which way it should face. The flat side will more often than not look best as the ‘top’ of the rock and should be placed in that way. Naturally occurring rock generally retains a horizontal line and this should be reflected in garden rock. Granite rock placed with attention to horizontal lines. It is important to achieve a balance when placing rock and you should blend different sizes and shapes together to achieve natural groupings. Many people believe that natural elements should be grouped in odd numbers, however I’m not so bound by that idea. I think two rocks of different shape can look great when put together. Rocks in pairs can work! The rock yard at a landscape suppliers can be quite overwhelming, with piles of granite, basalt (volcanic rock), mud-stone, sandstone and more. What is important is to choose your rock and stick to it. A pile of mixed rock types does will probably look just that, a pile of rocks. What you are after is a natural looking rock formation. Not how you should place rocks in your garden. Above all, trust your instincts. When you place a rock in the garden, it should be pretty clear to you whether it looks good or not. If you don’t like the way it sits, then rotate it, tilt it, nudge it. I like to walk away from the placement of a rock and then turn and look at it from a different place in the garden. If it looks out of place you will know straight away. Rocks can be heavy. Make sure you take the right precautions when lifting or moving rocks. You want to avoid that back injury, crushing your fingers or dropping a boulder on your foot. As always, there are exceptions to everything I have mentioned above (apart from the injury prevention) and some of the most iconic modernist landscapes feature rock piles, rocks propped above the ground or blended rock types. What are the keys to using rocks in your landscape? How great is the Monash garden- for a geography nerd like me it is just the best ! It is stunning! I have only seen it in photos but I am so impressed. Truly inspirational for fellow LAs. Rush/Wright have long been a stand out firm on Australia.